ALTEN capitalises on more than 20 years of know-how in preparations for the assembly, validation tests and final integration (before launch) of various satellites for CNES and other industrial customers. Satellites contain extremely costly electronic equipment (sometimes in excess of 1 million euros) with lengthy manufacturing times. Integrating these sub-systems on the satellite platform requires precision and preparation. 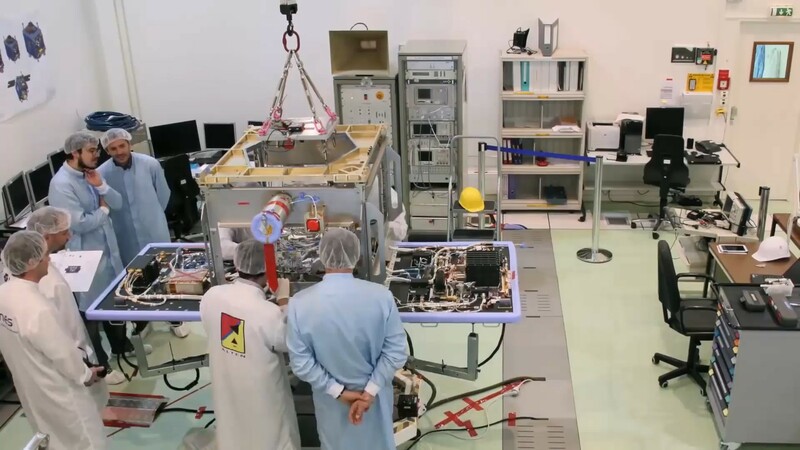 Check that the satellite is operational after assembly (environmental trials in space or launch conditions: extreme temperatures, near-vacuum pressure, vibrations and electromagnetic compatibility). ALTEN’s engineers work in cleanroom (ISO8 & ISO5 classes) as well as on launch sites (Kourou, Baikonur, Jiuquan, etc. ), on different types of satellite projects in a variety of fields: research (such as TARANIS, the study of transient luminous events – TLE – and terrestrial gamma-ray flashes), Franco-Chinese cooperation (CFOSAT, the study of wind and waves on the ocean surface) and the constellation of 600 telecommunications mini-satellites (ONEWEB).